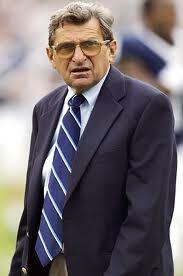 Legendary Penn State football coach Joe Paterno passed away over the weekend at the age of 85. Paterno was the head man at Penn State for over 40 years and built a legacy of greatness on and off the football field at Happy Valley over the years. For many, especially without a lot of football history, they know Paterno as the coach fired abruptly in disgrace last November when it was revealed that a former assistant coach had allegedly abused children. There are still questions on what Paterno knew, when he knew, and what actions he took. On one of his final interviews, he acknowledges he felt he did the right thing, but in retrospect, he should have done more. There are many ways people will view the life and legend of Paterno. I think I will choose to remember him as a man who had great impact on the lives of countless young men. Yes, I believe he made mistakes in the Jerry Sandusky situation. Yes, he should have done more. But in the end, when you take a look at the entire body of work, the final few pages of the last chapter should be viewed in perspective of the whole book. How often do we judge people or issues based on a small sample set, rather than the entire body of work? The next time you have to, I hope you consider perspective in your decision.